For the last three weeks I was determined to get Die Macher to the table on a normal game night. My first and only other time playing it was over a year ago. The 5-player game took about 7 hours. This fact gave some pause to try it in a 4- to 5-hour block of time. I figured so what? We could always play it over two sessions if necessary. So three of us--Josh, Mike, and myself--dove in head first. Setup was a little involved. There are many things to sort, stack, shuffle, deal, and organize. I had to consult the rules a few times: one meeting marker per region, €25,000 starting cash, 5 party membership. During the preliminaries where players secretly select their starting positions in meetings, media, trend, etc. there were the obvious questions about what each thing was good for. We had all watched Scott Nicholson's excellent video, but Die Macher is intricate enough that it's difficult to put any sort of plan together the first time you play. Our first round took over an hour. This was partly our unfamiliarity with the process, and partly not knowing what were reasonable decisions. One of the minor pains is that some phases do regions in order, and some in reverse order. Our player aids didn't show this. Subsequent rounds played faster and faster. After the first two rounds, Mike had won both elections, gaining huge VP's in mandate, national media, and party membership as well. He was literally ahead of Josh and I by more than 100 points. I felt like the game was already over. What wasn't obvious to me at the time was that Mike had ignored all else to get this lead, and had spent a lot of money. I kept buying media and using Shadow Cabinet to replace media. I cashed in votes even when the conversion factor wasn't particularly high. This allowed me to control Coincidence quite well. Mike and Josh had some platform overlaps, and I was determined to oppose that when possible, preferring instead to tweak the regions in those issues instead of my party. Although I still felt behind, I did feel in control. There were only 2 opportunities for Coalitions. One failed due to insufficient Coincidence, and the other due to lack of interest. More than two thirds of the Opinion Polls were unfavorable to the high bidder, so we were often rolling to increase party membership. I think I only won 2 elections. One was in round 6. I was able to make my platform coincide with the national opinion 100%! This was undone after the 7th election, but of course the effect was small. Jim - 295, Mike - 281, Josh - 275. I was very surprised at the close ending given our different styles of play. Mike played big money, big party. Josh played a tighter economy, avoiding big bids for anything, perhaps opportunistic. I played the media control and vote majority game. Not counting setup, we played in less than four hours. We have now established Die Macher as a "game night game". I suspect it will come out much more often. The three of us could probably play again in about 3 hours. Even with five players, it would not take 4 hours. Note: I think we played one rule wrong. During the Media Phase, you can keep buying Media markers one at a time until everyone passes. We played each player could only buy one. The first thing new players need to understand is how the game is scored. Forget about all the terms and the phases. Focus on the Victory Points! Your score at the end of the game is the sum of the Seats won from the 7 elections (votes converted into VP), the values of your media markers on the National Board, your party membership, your coincidence with the National Opinion, and a few small bonuses. The second thing new players need to understand is where money comes from. You start the game with €25,000. After each election you collect €1,000 for each Seat won. After elections 1, 3, and 5 you collect €1,000 for each party membership. At the end of each round, you can accept contributions from €10,000 to €50,000. The last thing is winning elections...or at least doing well in them. Players hold party meetings in the regions. Each round they may be converted into votes, each meeting being worth so many votes based on a multiplier. This multiplier is the sum of the Trend and Coincidence. Trend is simply a value shown on a scale the board (-3, -2, 0, +2, +3) representing how well your party is liked. Coincidence is the total number of issues where your party matches a region minus the total number of issues where your party opposes the region (non-matching issues count as zero). Every round, until the regional election is held, you can change Trend using Shadow Cabinet cards and Opinion Polls, and Coincidence by adjusting your party's platform or by adjusting the region's opinion. Changing your platform to improve your Coincidence in one region may adversely affect it in others. Changing a region's opinion to match your platform (when you are able) may also help your opponents. These are all very interesting decisions. The trick is not simply to wait until your multiplier is at its maximum to cash in your votes. One, since you may only have 10 meetings at a time, cashing in votes allows you to hold more meetings. Two, if a player has more votes than all the other players combined in a region, they can change one opinion. It's all about timing. This is the name for a set of spaces on the Organization Board where a number of Opinion Cards are placed with which players can exchange regional Opinion Cards. The rules have changed from edition to edition. We played using the Valley Games rule where there's always six cards there. I found this to be a poor choice. Six is not enough to provide a good decision space. The official 2nd edition rules, as far as I can tell, are that all swapped regional opinions, and all leftover opinions (after the election) go there. Swapped out national opinions do not. This would have the effect of increasing the Exchange Pool by 1 or 2 cards each round. There would be between 11 and 16 cards to choose from during the 6th (final) round. Is this too many? Does the system break down if every side of every issue can be swapped in by the end of the game? Die Macher is certainly striking. But is it functional or gimmick? I think a little of both. I could take or leave the 4 spiraling boards with circular layout. It could be so much better as a single board. My main issue is with what I call "decoding the game" (future in-depth blog post about decoding games in general). You spend a lot of time in Die Macher calculating Coincidence--players to regions, players to players, and players to national. In a 5-player game, there are 5 sets of 5 platform cards, 4 sets of 4 regional opinion cards, and 1 set of up to five national opinion cards. These are laid out all over the place, and are in essentially random order. Change one region card, and you have to recalculate Coincidence for every player. Considering playability alone, Die Macher could be played much more easily on a single 24x24" board (61x61 cm). The national opinion, regional opinions, and player platforms would all be a single table. For each row there would be 7 columns, one for each issue. A black cube means no/less, and a white cube means yes/more. Looking across the table, you could instantly see Coincidence between players, players/regions, and players/national. The Exchange Pool would also be a row on the table where multiple cubes could sit in each cell. This idea would eliminate 5 of the 6 boards, cut required table space in half, and probably reduce game time by an hour. The way cards are used (if at all) would need to be changed slightly, but it would have minimal affect on probabilities. 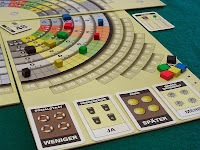 How did you feel about Die Macher as a three-player game as opposed to a five-player game? This is a very relevant issue for my ever getting it to the table under acceptable circumstances. - Less opportunity for coalitions. We had none in our game. I think this mechanism makes the game a little more interesting. - It's easier for a player to have a vote majority with 3p. With 5p, it would be a lot more work. - Money would be slightly tighter. Overall I think the game plays perfectly fine with 3, and I'd play it that way any time. But it's probably a little better with 4 or 5. Must play this soon - it's been unused too long. 7 hours? That's long. We run about 4 hours with five players.